The poet Christopher Smart — also known as “Kit Smart”, “Kitty Smart”, “Jack Smart” and, on occasion, “Mrs Mary Midnight” — was a well known figure in 18th-century London. Nowadays he is perhaps best known for considering his cat Jeoffry. Writer and broadcaster Frank Key looks at Smart’s weird and wonderful Jubilate Agno. Christopher Smart, by unknown artist, circa 1745 — Source. James Boswell, The Life Of Samuel Johnson, LL.D. Dr Johnson thought his friend should not be confined, but ‘society’ thought otherwise, and Christopher Smart (1722-1771) was incarcerated in St Luke’s Hospital for Lunatics in Bethnal Green, London and then in Mr Potter’s private madhouse between 1757 and 1763. He died, eight years later, in debtor’s prison. These private miseries overshadowed the reputation he had gained as a poet and contributor to periodicals. He was a prolific writer, in both Latin and English, and five times won the Seatonian Prize, awarded to a Cambridge graduate for the best poem on “the perfections or attributes of the supreme being.” A Song To David, the major work published in his lifetime, was not well-received, however, and until Robert Browning championed it a century later, Smart was more or less forgotten. It was not until 1939 that his masterpiece, written during his confinement in St Luke’s, was first published. Jubilate Agno is one of the most extraordinary poems in the English language, and almost certainly the reason we remember Christopher Smart today. It has been described as a vast hymn of praise to God and all His works, and also as the ravings of a madman. Indeed, that first edition was published under the title Rejoice In The Lamb : A Song From Bedlam, clearly marking it as a curio from the history of mental illness. It was W H Bond’s revised edition of 1954 which gave order to Smart’s surviving manuscript, restoring the Latin title Jubilate Agno, bringing us the poem in the form we know it today. Christopher Smart never completed the work, which consists of four fragments making a total of over 1,200 lines, each beginning with the words “Let” or “For”. For example, Fragment A is all “Let”s, whereas in Fragment B the “Let”s and “For”s are paired, which may have been the intention for the entire work, modelled on antiphonal Hebrew poetry. References and allusions abound to Biblical (especially Old Testament) figures, plants and animals, gems, contemporary politics and science, the poet’s family and friends, even obituary lists in current periodicals. The language is full of puns, archaisms, coinages, and unfamiliar usages. Dr Johnson famously said “Nothing odd will do long; Tristram Shandy did not last”. Jubilate Agno is, if anything, “odder” than Sterne’s novel, and perhaps we are readier to appreciate it in the twenty-first century than when it was written. One section, much favoured by anthologists, gives some of the flavour of the work. A page from Smart’s manuscript of Jubilate Agno. 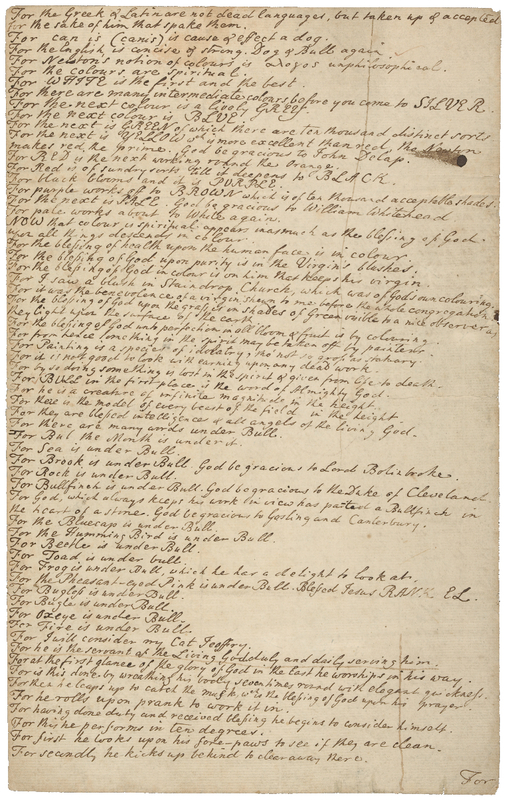 The section adulating Jeoffry begins ten lines from the bottom and continues on to the end of the next page — Source: Houghton Library, Harvard University. Here we have an example of what one could call Smart’s “encyclopaedic” style, his passion for listing and enumerating. And whereas the description of his cat is fairly straightforward, other passages in the poem are deeply obscure, seeming to emerge from some private store of reference. It has been suggested that, in his confinement, Smart had access to just six books: the King James Bible; Ainsworth’s Latin Thesaurus; Salmon’s guide for London pharmacists (in Latin); Miller’s Gardener’s Dictionary; and Hill’s Useful Family Herbal and History of Plants. The modern reader cannot hope to grasp every reference and allusion scattered within the poem, but Smart’s language is exact and exquisite, with a musicality that becomes hypnotic. For a DREAM is a good thing from GOD. For there is a dream from the adversary which is terror. For the phenomenon of dreaming is not of one solution, but many. For Eternity is like a grain of mustard as a growing body and improving spirit. For the malignancy of fire is oweing to the Devil’s hiding of light, till it became visible darkness. For the Circle may be SQUARED by swelling and flattening. For the Life of God is in the body of man and his spirit in the Soul. For there was no rain in Paradise because of the delicate construction of the spiritual herbs and flowers. For the Planet Mercury is the WORD DISCERNMENT. For the Scotchman seeks for truth at the bottom of a well, the Englishman in the Heaven of Heavens. As that last line perhaps indicates, one of the great joys of Jubilate Agno is in its sudden dislocations and unexpected diversions. The “my cat Jeoffrey” passage is justly famous, but the poem is cram-packed with similar wonders, and must be read in full to appreciate its inimitable genius. Frank Key is a writer and broadcaster best known for his self-published short-story collections and his long-running radio series Hooting Yard on the Air, which has been broadcast weekly on Resonance FM since April 2004. In a Hooting Yard special, on December 27th 2007, Key and the performance artist Germander Speedwell performed the whole of Jubilate Agno live, a performance which ran in excess of three hours.